Winter has arrived in the southern hemisphere and Perth has had its worst storms in a long time this past weekend. Winter is associated with colds and other illnesses. Whilst viruses are present in the environment all year round more cases are seen in winter. Some people rarely get viral illnesses and others are frequently sick. Equal exposure to viruses does not mean equal numbers or severity of infections. 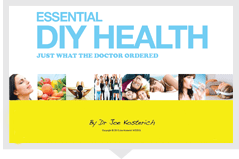 Louis Pasteur, the father of germ theory reportedly said on his deathbed “the seed (germ) is nothing, the soil (body) is everything.” Whether you get a virus will be more determined by your health rather than the virus. If this were not the case everyone would be equally affected. Our protective roof against viruses is our immune system. When it is fully functional, it will stop any virus and we don’t get sick. This happens each day, as we are constantly exposed to viruses, and we don’t even realise it. We become sick when a virus has gotten through the immune system (through the hole in the roof.) At this point the immune system works double time to clear out the invader. Symptoms such as a fever and tiredness tell us the immune system is working. Two questions that arise are what leads to a weakening of the immune system and what can be done to strengthen it. Attitude and stress are major contributors to weakened immunity. A Spanish University study showed people with a negative outlook on life had four times the likelihood of getting a cold than those with a positive outlook. Those who felt stressed had 3 times the rate. New work has shown that those who are under consistent stress become “resistant” to cortisol, which is one of the bodies stress hormones. This resistance can lead to getting more viruses and also to the symptoms being worse. Lack of sleep, eating too much sugary food, overwork and even some medications can lower our immunity. Smoking and exposure to other toxins are also factors. Getting a virus may be a sign that the body is overloaded and hence the virus has slipped through the immune system. When ill, people will rest and reduce their load – just what the body needs. This is a bit like repairing the hole in the roof before it gets bigger. Our goal however is to keep the roof free of holes. Here are four simple tips on helping your immune system. 3) Many people may benefit from vitamin supplements, particularly antioxidants such as vitamins A, C and E. Zinc, and Folate supplements are also helpful. Get enough vitamin D either from the sun or a supplement. 4) Make sure you get enough sleep, as this is the bodies recharge the battery time and drink 35ml/kilo of water each day. 5) Most importantly examine your workload and stress levels and take steps to reduce them before they reduce your immunity to illness. Your immune system is your best protection against illness in winter or at any time of year. We can tend to forget about it as it is hidden. We only really notice it when something has slipped under its guard. Value and look after your immune system in the same way that you value a roof over your head.